Aching joints and muscles are common symptoms of the flu. These are a result of the immune system releasing inflammatory chemicals into the bloodstream. 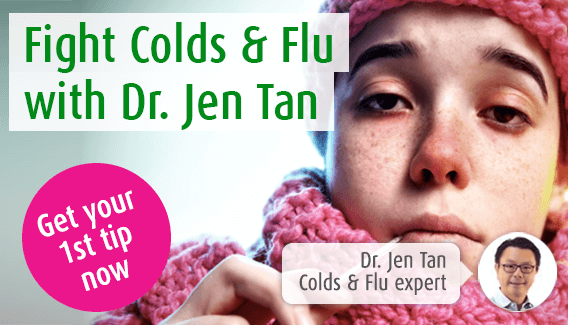 In this page, our immune system expert Dr. Jen Tan addresses the causes of flu induced muscle and joint aches and discusses the herbal treatments available to relieve any pain or discomfort. Aching joints and muscles are two of the most common symptoms of the flu, and are part of the reason why you feel so much worse than when suffering from the common cold. Joints may feel stiff and sore, but you should be able to fully move them, even if it is achy to do so. Additionally, they should not be red or swollen, so if you experience these symptoms, then it is worth seeking medical attention to rule out any underlying causes of your joint pain. Why does the flu make my joints ache? When you are already suffering from fever, coughs and headaches, it seems unfair that aching joints should be added to the list of symptoms. One task of white blood cells is to repair and rebuild muscle fibres which are damaged from day to day. However, when you have the flu, your immune system diverts the white blood cells from this function to fight off the flu virus, thus leaving your muscles and joints feeling sore and achy. In addition, white blood cells produce a chemical called cytokines when fighting the infection. This causes inflammation in muscles and joints, resulting in pain in a similar way to mild arthritis or rheumatism. However, this achy feeling is temporary, and once your body has fought off the infection, symptoms of achy joints will ease. First of all, it is worth giving your muscles plenty of time to rest and relax. Trying to carry on as if you are perfectly fit and healthy will slow recovery as your body will not be able to put valuable energy into fighting off infection. As white blood cells are diverted from the muscles into fighting infection, your muscles are more susceptible to wear and tear. Thus, allowing your body to rest should prevent worsening of muscle pain. You may also find relief from warming or massaging your joints. Some people find a warm cloth around painful joints is comforting, others find that a rub of warm olive oil or peppermint oil soothes your muscles or joints. It can also be very soothing and refreshing to have a warm bath, particularly with bath salts or essential oils. If you are looking to reduce a fever, a bath like this may help to lower your temperature. The most effective herbal remedies will be those which tackle the root of the problem – in this case, treating the flu which is causing your achy joints. Introducing Echinaforce® Hot Drink, it's our newest product in our Echinaforce® range. It combines our well-known fresh Echinacea root and herb extracts with Black Elderberry (Sambucus nigra) to produce a soothing and palatable hot drink. Just what you need to help fight off symptoms such as aching limbs and headaches when you are struck down by the cold or flu. "A really comforting drink and my cold was a lot shorter and less debilitating than usual!" A number of proprietary remedies for treating the symptoms of colds and flu are available from your local pharmacy. These work as painkillers and will help to relieve a variety of flu symptoms including aching joints. A doctor is unlikely to prescribe flu medication unless your condition is serious. There are two main types of anti-viral drugs – Oseltamivir and Zanamivir. However, if you are particularly vulnerable to the flu, a doctor may also recommend a flu jab. Although this should be able to prevent you from contracting the cold in the first place, you may experience some mild side-effects, including aching joints, which should subside quickly.